1. Wear Red – To raise awareness, let’s turn the world red. Choose a red shirt, dress, pants, hat, tie, scarf, or even socks. Wear red alone or join together with friends and colleagues to make a statement for a great cause. 2. Give – Help raise awareness that heart disease is the greatest threat to women and encourage them to take action. Every dollar makes a difference in the fight against heart disease – the leading cause of death in the world. 3. Open your heart and contribute to the American Heart Association’s efforts to help build healthier lives, free of cardiovascular diseases and stroke. Your gift can change lives: Nearly 80 cents of every dollar donated is spent on research, education and community outreach. Chances are we all know someone affected by heart disease and stroke because about 2,200 Americans die of cardiovascular disease each day. That’s an average of 1 death every 40 seconds. But together we can change that. Let’s make a big impact! Bring people together at work, school, your place of worship, in your community, or at your social clubs and events. 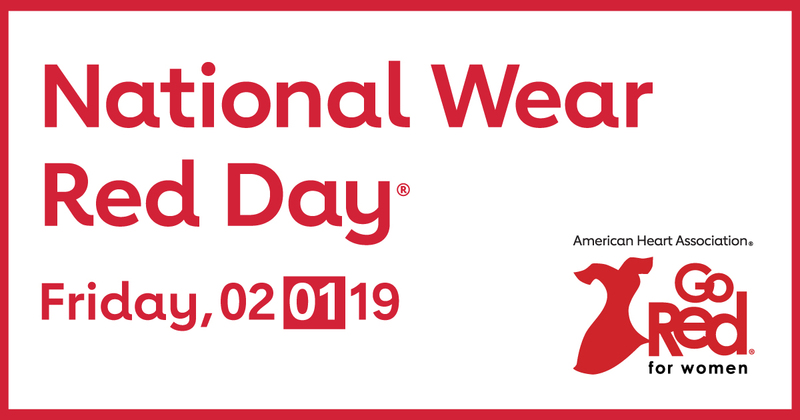 There are lots of ways to be a part of Wear Red Day and American Heart Month. It’s easy to do anywhere and with everyone.